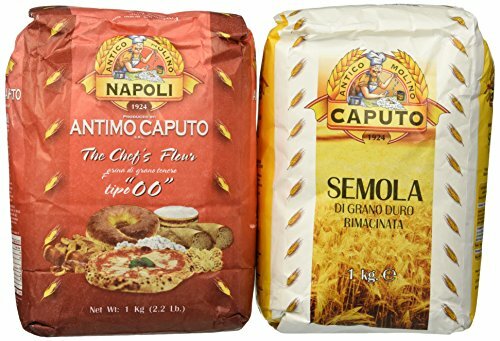 One bag each Antimo Caputo 00 Flour and Semola Semolina Flour. The chef's choice for pizza flour, this makes a fabulous pizza. If you are making the effort to make homemade pizza, you'll want to always have the best ingredients. Do you recognize this famous red bag? Produced in Naples since 1924. Semolina is the purified milling of durum wheat. Semola is derived for the Latin word for flour, and semolina is the common name for this special flour. This ingredient adds structure and bite to homemade pasta and a small amount added to pastry dough adds a rustic character. A very necessary ingredient for Semolina bread. From Antimo Caputo in Naples. Semolina made from durum wheat is yellow in color and high in gluten. Semolina is recommended for homemade pasta, breads, and baking. (Brick not included). If you have any questions about this product by Molino Antimo Caputo Napoli, contact us by completing and submitting the form below. If you are looking for a specif part number, please include it with your message.